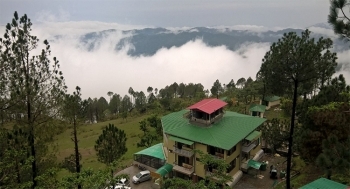 Lansdowne Hill Resort is a deluxe hotel located in the prestine beauty of Lansdowne in Pauri Garhwal district of Uttarakhand. The majestic and panoramic views of the sunrise and sunsets from the windows filled guests with peace and joy. The comfortable rooms and unmatched hospitality of the resort makes its an ideal place for holidays and weekend romantic getaway. The resort is located at Palkot, just 6 kms from Lansdowne main town on Kotdwar road. The resort offers 30 well furnished and decorated rooms, categorized in 19 Deluxe, Super Deluxe, Luxury rooms with 5 Cottages. 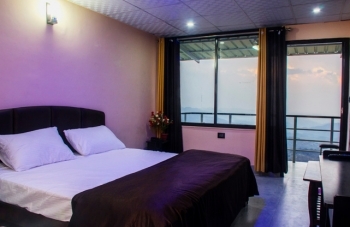 Each accommodation has all modern amenities and facilities like King size beds, attach bathroom, Coffee/ Tea maker, hot/cold water, TV and intercom. The resort has a multi cuisine restaurant, satisfying taste buds of guests by serving Indian, Chinese, Gujrati and Continental cuisines. The prompt room service makes guests to dine at their own privacy. - Child 06-12 yrs (With Extra bed) – 500/- (Room Only basis) Rs.650/- with breakfast , Rs.850/- with Breakfast , lunch or dinner, Rs.1050/- with Breakfast , lunch and dinner. - Child above 12 yrs/ Extra Adult (With Extra bed) – 500/- (Room only basis ) Rs.700/- with breakfast , Rs.1000/- with breakfast, lunch or dinner, Rs.1300/- with breakfast, lunch and dinner. Lansdowne is one of best weekend getaway from Delhi, located at just 245 kms from Delhi. Regular buses are available from Delhi ISBT Kashmere Gate to Kotdwar. From Kotdwar, guest can hire a taxi or board bus or take sharing taxi to Lansdowne. By Rail : Kotdwar is nearest railway station at 40 kms from Lansdowne. Garhwal Express and Mussoorie Express are the trains between Delhi and Kotdwar. By Air : Best way to reach Lansdowne by air is to to take flight till IGI, New Delhi. From there, continue journey by road or rail.